Guest contributor, Barbara, takes us on a tour of the most beautiful places in Austria. 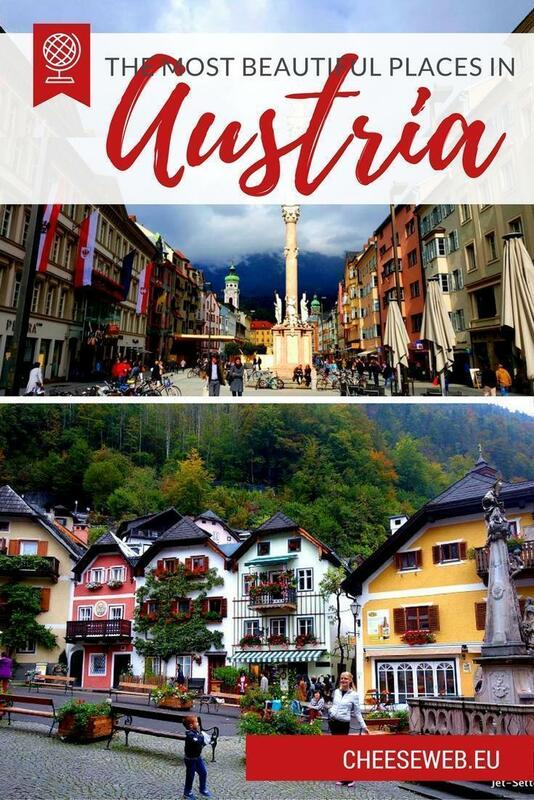 From the bustling capital of Vienna to picture-perfect Halstatt, she takes us through the some of the best places to visit in Austria. Austria, situated in the heart of Central-Europe, is an exciting country with a rich historical background, fascinating cities and beautiful mountains. It has many famous ski resorts, as some of Europe’s most beautiful mountains are found here. The Alps stretch across the western part of Austria all the way down to Italy. Austria has a lot to offer visitors. It is a cultural centre of Europe, famous for its classical music and Opera. 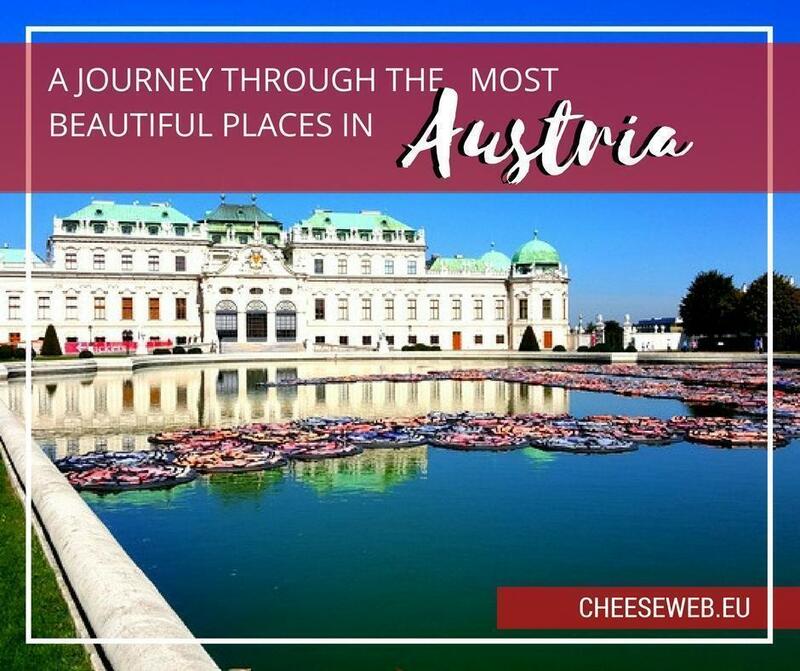 This fascinating, diverse country is an ideal destination for tourists, who want to explore the imperial capital of Vienna, learn about classical music and culture, and enjoy winter sports in the Alps. We flew into Austria’s capital, Vienna, a city of almost 2 million inhabitants. The city lies on the east side of the Danube River and was home to famous musicians like Mozart and Beethoven. Philosopher Sigmund Freud also lived and worked in the Austrian capital. The city has always been an intellectual centre of Europe and was the capital of Austro-Hungarian Empire until the end of WWI. We were excited to explore the city and learn about its rich culture. The next morning, we started the day by visiting the Belvedere Palace, one of the many palaces visitors should explore in Vienna. 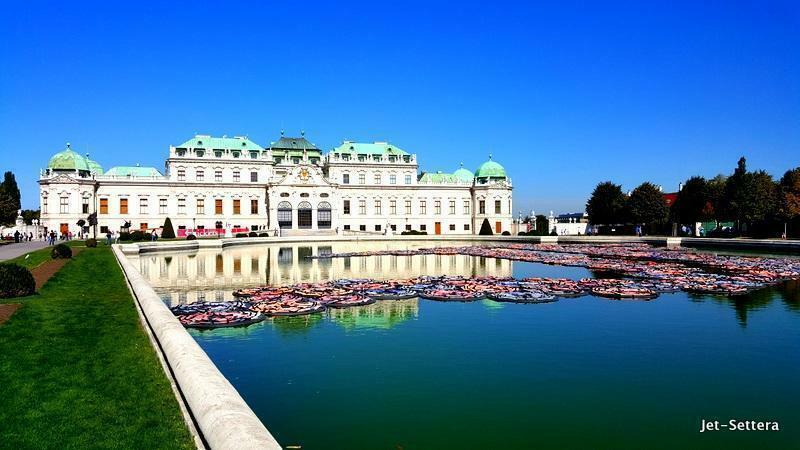 The Belvedere has a huge garden in the front and a giant fountain with an art installation on the surface in the back. The Belvedere today serves as a museum. The most famous Austrian contemporary artist, Gustav Klimt, displays his art here. His exhibit is gorgeous, and I highly recommend it to everyone. After the Belvedere, we walked into the city centre to visit another of Vienna’s famous sites, the Stephansdom. This massive church is the mother church of the Roman Catholic religion in Austria. The next stop was at the Julius Meinl supermarket. I show this supermarket to everyone, as this is the most beautiful supermarket in Vienna with products from all over the World. From the Julius Meinl, we visited the Hofburg Palace, an imperial palace of the Habsburg family. It was built in the 13th-century, and it served as a winter palace for the ruling family. Schönbrunn Palace was their summer residence, a grandiose Baroque palace, just outside of Vienna. It is another beautiful tourist attraction and an easy day trip for visitors to Vienna. We ended the day by walking down the MariahilferStrasse, the famous shopping street of Vienna, where visitors can find many interesting shops and try some traditional food at one of the touristy restaurants. Wienerschnitzel (breaded, fried veal) is a local speciality. We also dropped by a beautiful pastry store to taste the Sachertorte, the most famous cake in Austria. Even John Lennon mentioned it in his song Ballad of John and Yoko. In the evening, we hopped on a train and headed to our next destination, Salzburg. Salzburg is a three-hour train ride from Vienna. On the way there, I reserved a hotel on my phone. Salzburg is a popular tourist destination, and hotels are expensive. Most of the rooms were already sold out, but we found a last minute room near the train station. I would recommend you book your hotel in advance, to avoid any surprises. I think we just got lucky with a last minute room. The next morning, we walked around and discovered the city. 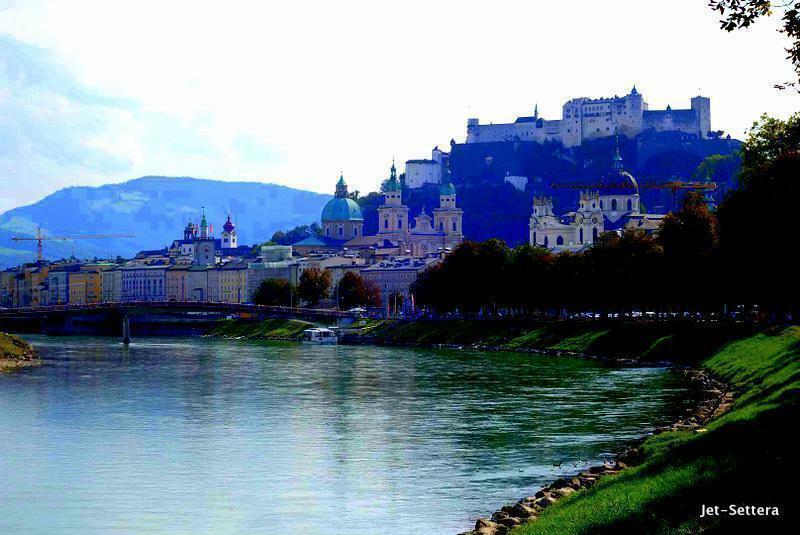 The old town of Salzburg is a beautiful UNESCO World Heritage Site. It is famous for being the birthplace of Mozart and an important city for classical music. The movie, The Sound of Music was filmed here. We went to see Mozart’s birth house. It was massively touristy. We walked from there, up to the peak of Salzburg to see the city from above. The view was beautiful; we could see the entire city and the river below us. We finished the day at the Sacher Pastry Store at the Sacher Hotel. After tasting some of the fancy pastries, we headed over to a local restaurant called Zum Fidelen Affen for dinner. The place is famous for its authentic Austrian dishes. After a long wait for a table, we had some delicious local Austrian specialities. The next morning, we hopped on the bus to the nearby village Hallstatt. It took us about an hour to get there. This small Alpine village is a UNESCO World Heritage site and one of the most picturesque towns, I have ever seen. Hallstatt’s 16th-century Alpine houses are built around a lake, with a Gothic Catholic Church in the centre of the town. It is the oldest, most photographed village of the country. It is a favourite destination for Chinese tourists and thousands of them come to visit the town every year. 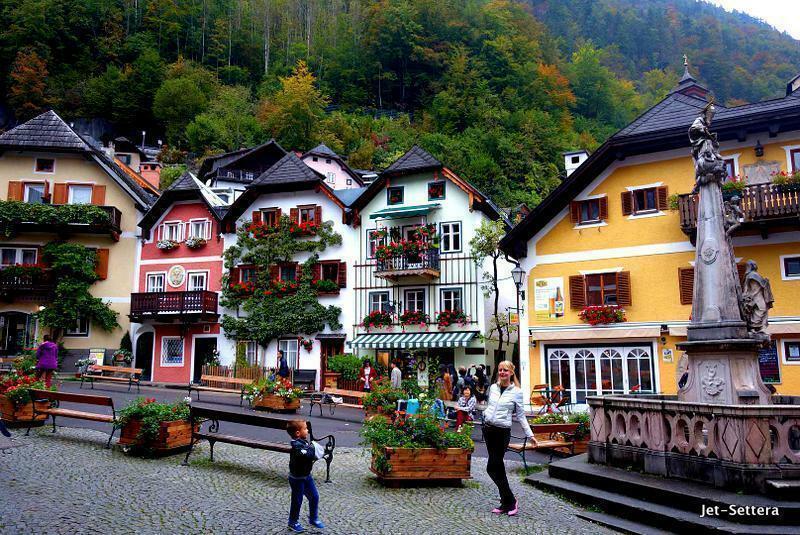 In fact, they love Hallstatt so much that they even built a replica of it in China. 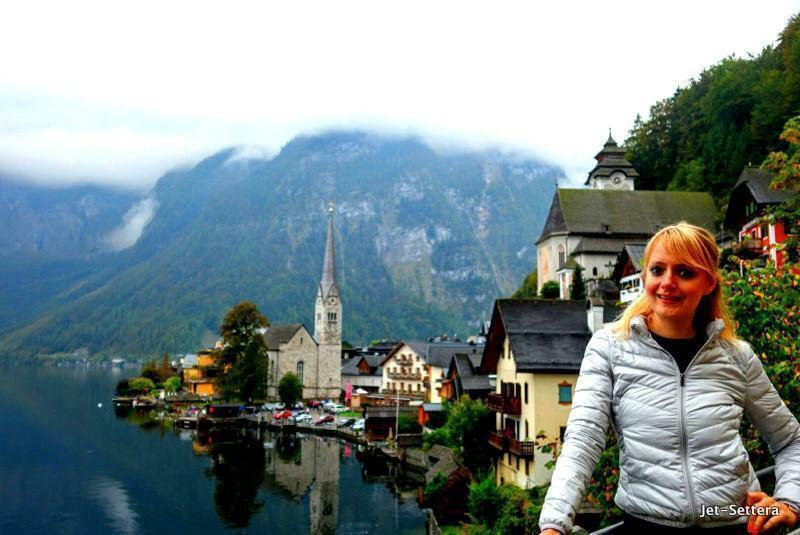 It’s no wonder Hallstatt is one of Austria’s most popular towns. We walked around the centre, took a couple of photos, and sat down in a local restaurant to have a Goulash Soup and an Austrian Cheesecake. This cheesecake became my favourite thing for the rest of the trip, and I kept having it after every meal. It is a tasty cake made out of cheese, and it is a bit sour. After a long and beautiful day in Hallstatt, we hopped back on the bus to return to Salzburg for the night. 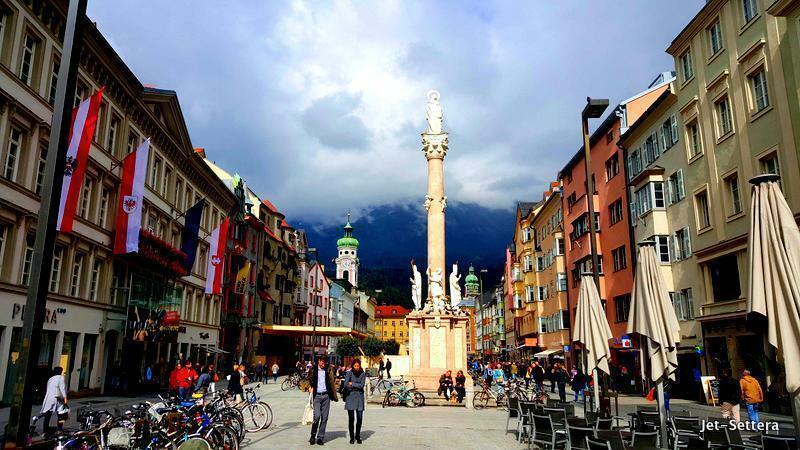 Colourful Innsbruck, Austria is a must-visit destination. Innsbruck, the capital of Tyrol, was about two hours away by train. The temperature dropped significantly when we reached the city, as we were in a valley surrounded by mountains. Innsbruck is a favoured destination for winter sports lovers. The city hosted two Winter Olympics in the past. Many of the famous ski resorts are near Innsbruck. Innsbruck is also known for its imperial and modern architecture. The city has beautiful buildings and churches all over. My favourite was the “Goldenes Dahl” (golden roof) in the city centre, a building with a golden roof. Innsbruck is surrounded by mountains and there were big clouds right above us, so we could never see the top of the peaks. It is a charming city everyone should visit. Austria is a fascinating country, with a lot to offer visitors. It is not cheap, but the infrastructure is excellent for tourists, and it has some very picturesque towns and fascinating history. I had visited Vienna many times, but this was my first time exploring more of the country, and I was positively surprised by how beautiful it was. Barbara is a London-based luxury travel and lifestyle blogger of Jet-Settera. She left her country when she was 17 to conquer the world as a model. Ever since she has lived in seven countries and visited 68. She blogs about exclusive destinations and the some of the most prestigious events around the world such as Venice, Cannes, San Sebastian Film Festivals, Oscar Parties in LA, Fashion Weeks in Milan or Paris, yacht parties in St-Tropez as well as Prince Albert’s wedding in Monaco. 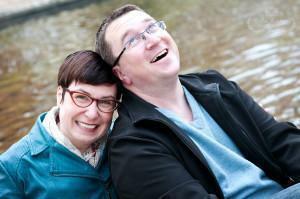 She also writes about adventure travel across Asia, South-America and Europe. Read about her latest adventures to Indonesia on her blog.